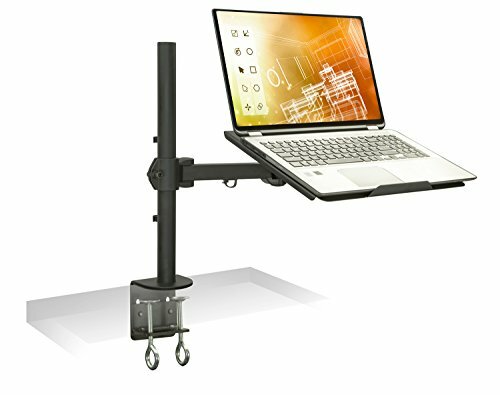 MI-3352LT laptop desk mount helps reduce the risk of back and neck injury that is common with hours of sitting in an incorrect body posture. By raising the laptop computer to an ergonomic height you can create additional desk space while lifting the screen to an optimal user height. A perfect solution for limited space applications by removing clutter from the desktop, using work space effectively and mounting laptop computers conveniently. Full motion capability allows the user to move the laptop closer or farther away, as well as turning it left and right. The arms holding the tray can be lifted or lowered on the 17.7 inch high pole. Cable management clips helps organize cables running to the computer. The vented tray supports notebooks up to 17 inches in screen size with a total load capacity of 22 lbs. High-quality steel and Aluminum materials ensure durability and elegant looks. Sturdy double-clamp base does not require special tooling and can be safely connected to desks up to 3.15 inches in thickness. Mount-It! has over a decade of experience in TV, computer and monitor mounting solutions with tens of thousands of positive reviews on our products and our service. We offer around the clock support for product installation, set-up as well as troubleshooting.